Home News US Navy hospital ship anchors in Colombia, provides care to Venezuelan refugees. Caracas is upset. A U.S. Navy hospital ship anchored off the Colombian coast has begun providing free medical care for Colombians as well as Venezuelan refugees who’ve escaped their country amid turmoil. 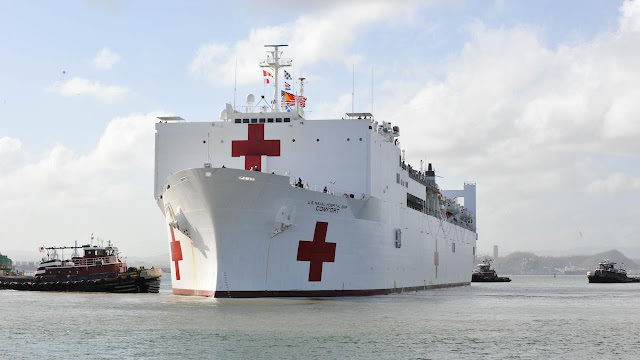 The USNS Comfort’s recent arrival in the port city of Turbo could cause additional tensions between Washington, D.C., and Caracas, Venezuela, where officials have denied the country’s humanitarian crisis, The Guardian reported. “The deployment reflects the United States’ enduring promise of friendship, partnership and solidarity with the Americas,” the U.S. Southern Command wrote in a statement describing the mission. Colombia has struggled with an influx of about 1 million refugees who’ve taken shelter there. An estimated 3 million Venezuelans have fled because of the political turmoil and economic hardship at home, according to the United Nations. A shortage of food, drugs, vaccines, and other medical necessities in Venezuela has led to an outbreak of infectious diseases among refugees. The floating hospital, equipped with X-ray machines, an optometry lab, a dental suite, and 5,000 packs of blood, will treat patients who are ferried by helicopter to and from the ship, according to The Guardian. Colombian health officials are concerned about the rise in malaria and measles that have crossed the border. The Comfort’s crew of more than 900 doctors, nurses, military technicians, and volunteers have already treated patients in Ecuador and Peru. Next week, the ship will stop in Riohacha where it is expected to treat even more Venezuelans. Riohacha sits near the border between Colombia and Venezuela. It will end its duty next month in Honduras. Earlier this month, President Donald Trump imposed sanctions on Venezuela and even threatened military action against President Nicolás Maduro’s regime, USA Todayreported. “We’re going to take care of Venezuela,” Trump said. Adam Isacson, a security analyst at the Washington Office on Latin America, described the Comfort’s deployment a PR stunt.